With their victory in the TTT yesterday, Team Sky already have the pink jersey in their possession. 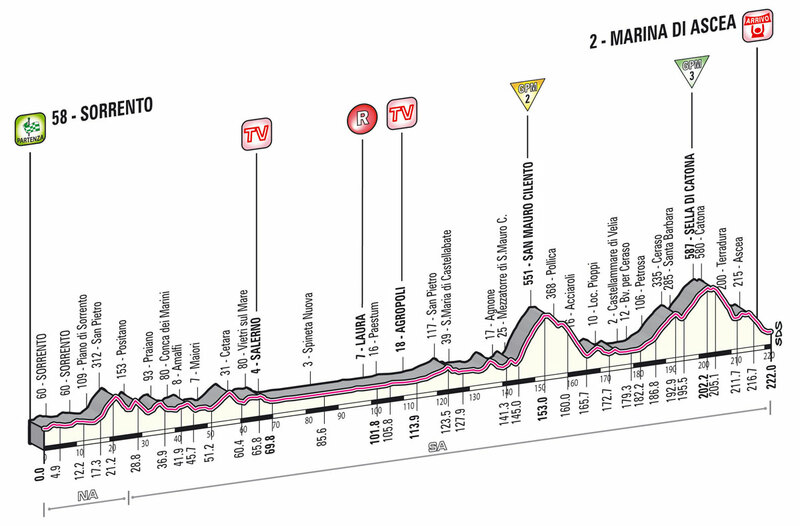 The third stage sees the peloton make their way from Sorrento to Marina di Ascea via the climbs of San Mauro Cilento and Sella di Catona. 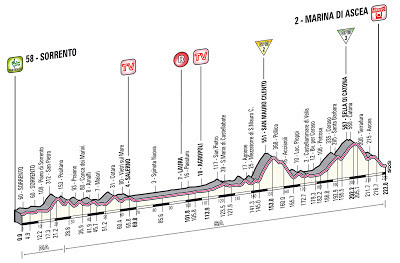 The first of these climbs – San Mauro Cilento – is a nasty short climb that should shed most of the pure sprinters from the group, while the leading teams are likely to set a fast pace up the latter to reel in any breakaway. This should shed any of the pure sprinters that have made it over the first climb. There is also a descent down to the finish, which could give the likes of Nibali and Sanchez the chance to try and take a few seconds on Wiggins, or to test Team Sky at the very least. This means that it should be a stage contested by either a small breakaway that is able to get away on the final climb or a sprint involving those sprinters that are able to climb a bit. Thus, it is no surprise to see Nacer Bouhanni at the head of the betting. He has been in excellent form recently and finished 3rd in Stage 1 showing that he can compete with the pure sprinters. He should be able to make it over these climbs, and if he does, it is difficult to see anyone that is likely to beat him. His main challengers are likely to be Matt Goss, John Degenkolb and Fabio Felline. These are all perfectly capable of making it over the climbs and contesting a sprint finish. However, as I said in an earlier preview, neither Goss or Degenkolb are in particularly good form at the moment. The young Italian, Fabio Felline, is an interesting one in this. Not technically a sprinter, he is a very fast finisher and would fancy his chances, whether he gets in a breakaway or in a sprint finish. Looking at a similar recent stage to this, we saw in the Tour de Romandie that Giacomo Nizzolo hung in grimly on the climb of the Col du Mollendruz to contest a sprint finish. It was surprising that he managed to stay in touch with the peloton and means that he certainly cannot be ruled out here at big odds. If he is in the final group, he is certainly capable of winning this stage. Nizzolo finished 4th in the opening stage to continue a good run of results in recent months. The other possibility is that Samuel Sanchez could attack on the final descent. Having lost so much time on the TTT yesterday, he desperately needs to make time back. He is undoubtedly one of the most gifted descenders in the sport and all he would need is a small gap and he would be gone. Given that he is already over a minute back on Bradley Wiggins, it is almost do-or-die time already and this would seem to be an early opportunity.